Last night Colleen and I paid a visit to a pizzeria called Juliana’s. The joint is operated by Patsy and Carol Grimaldi. Patsy is a New York City pizza legend, having learned his trade at his uncle’s pizzeria in the 1940’s (the famous Patsy’s of East Harlem, named after his uncle) and going on to carry on that tradition by opening his own Patsy’s in the 1990’s. Due to a legal dispute with those who bought the original Patsy’s, the name was changed to Grimaldi’s. Patsy eventually sold the shop to a trusted customer, but eventually the relationship soured when Patsy disapproved of the pizza-making practices that were taking hold in his absence. 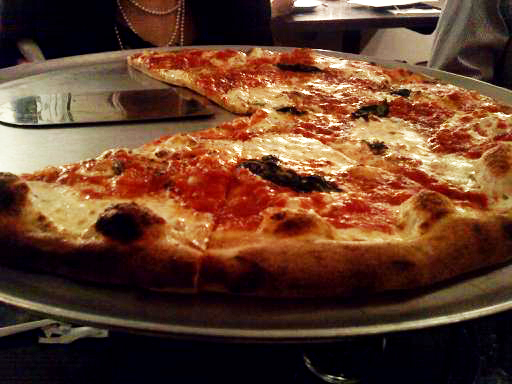 Grimaldi’s was forced out of their long-time Brooklyn location due to troubles with the property owner, and Patsy took the opportunity to set up shop in his old space with a brand new pizzeria. Locked out of using either his first or last name, Patsy Grimaldi decided to honor his mother with this venture. If that backstory isn’t enough to add some character to our visit, when we arrived to the location, we were struck by the relatively small, humble appearance of the shop. “Relative to what?” you might ask. Relative to the dauntingly large, fluorescent new incarnation of Grimaldi’s just down the block. The line outside Grimaldi’s dwarfed that outside Juliana’s, which was just fine by us. Standing in line, we noticed a glass of water, a cigar, and a half-eaten slice on the window sill outside. Just as Colleen wondered aloud who might abandon such a collection of objects, Patsy Grimaldi, wearing a chef’s jacket with his name embroidered on the breast, walks past, puts the cigar in his mouth and tosses the pizza crust into a nearby garbage bin. It was clear that he wanted to be there, running his pizzeria. He asked us how large our party was and promised us that we’d be seated soon. The entire staff treated us with friendly deference — cracking jokes, politely answering questions, and exercising patience despite being completely filled with customers. Pizzas passed by on their way to other tables, enticing me to instant envy. We placed an order for a margherita pie right away. The beauty of the pie made me feel ashamed to only have my cellphone as a camera. The pizza was delicious, with easily the best basil I’ve ever had. The aroma was punchy and the flavor was in balance with the sauce, cheese, and crust. The charring on the the pizza was masterful. 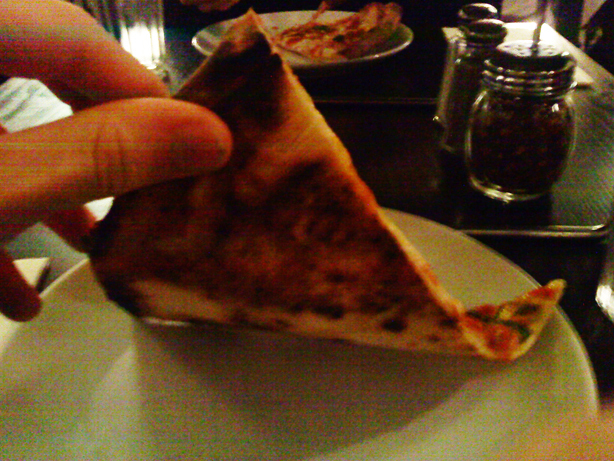 The slices were neither floppy nor rigid, and only required the slightest of folding to keep upright. The only things keeping the pie from perfection was that the crust was a little tough and chewy for my taste, though there were pockets here and there where it had risen a little more during baking that were just magnificent. I had also hoped for a bit more open crumb in the cornicione, as this pizza was of pretty uniform thickness from center to edge, but honestly it was difficult to be disappointed in anything throughout the visit. At one point Patsy sat down at the table next to us to spend some time with a toddler of a family he may not have even known. I was smiling so much I felt like my cheeks were going to go into spasms. Unrelated but equally contemporary, I did my first check of the specific gravity of the tripel to see how fermentation is coming along. Currently the gravity is down to about 1.019, which means it still has some drying out to do. I’m hoping to bottle it in about a week and a half, but it may be that the yeast have different plans. The sample tasted more like a desert wine than a beer, with sweet fruity flavor followed by warm alcohol. I’m very curious to see how this one will turn out once it’s done maturing over the next six months or so. This entry was posted in pizza and tagged narrative, review, tripel on May 11, 2013 by Dylan Bargteil.